Maria Marsala was just 14 years old when she begged her mother to sign the papers for her to be able to sell Avon door-to-door in Brooklyn, N.Y. Maria was an avid user of Avon products and thought selling them would be glamorous and fun, but more importantly she didn't want to work at her dad's beer and soda store anymore. "There was no heat or AC and it was dirty," she recalls. For two years Maria pounded the pavement peddling Avon products to women of all ages; but unfortunately, people just didn't take her seriously enough, forcing her to go back to her dad's store by age 16. 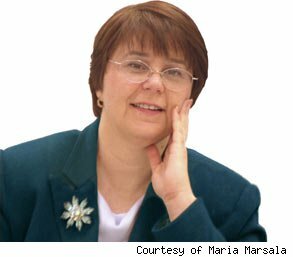 Ambitious, but derailed by her age, Maria vowed to one day return to selling Avon products. By the age of 21 Maria had worked her way up in the financial trading world from clerk to municipal bond trader to government bond trader, all the while continuing to order and buy Avon products for her own personal use. Many years later, Maria got into a terrible car accident that inspired her to sit down and make a bucket list of all the things she wanted to do before she died. "I realized that life was short," she says, "and returning to selling Avon products was on that list." So at 53, Maria kept that promise she had made to her 16-year-old self and went back to selling the products she had used all her life. When Maria rejoined the Avon selling force in 2007, she paid $10 and was given a 50 percent commission on anything she sold. Also, she was given a discount on demonstration materials. "To start in the business today, $210 would suffice," Maria says. "That would get you a variety of products and brochures to offer to clients when doing demonstrations." Today, Maria runs a coaching business full time out of her home in Washington state, but spends about 8-10 hours per week working on her Avon business, which yields a couple of hundred dollars per week. The work includes meeting with clients, putting brochures into people's doorways to generate new sales, and doing demonstrations at parties or gatherings. The majority of Maria's Avon clients find her on the Internet, or they call Avon's 1-800 number and are referred to Maria because she is close to them. "If they are not local, I call every person who buys something from me online and I send them out a welcome kit, a calendar and I find out what their skin type is. I want them to know that there is a real human being behind this business," she says. Maria says the upshot of selling Avon is that the name is synonymous with great products. "I don't have to do a lot of convincing." She also likes that this business can be whatever she wants it to be. She sold it door-to-door for two years when she was a teenager, moved to three different states, launched a career as a bond trader and then returned to selling 39 years later and it still works for her. Maria says that the catalog has so many products (lotions, makeup, skin care products, accessories, perfume etc.) in its 200 pages that it can be very overwhelming as a new representative to learn about each one, but at the same time, there is definitely something for everyone at Avon. Also, Maria learned the hard way that you have to put a face with the business if you really want to build something successful. "Its hard to build your downline without doing face-to-face sales. The Internet, website and blog are not enough." Eventually Maria would like to move back to the East Coast and work on building her downline, which involves recruiting, training and helping other reps that you bring on to the Avon team; but for now she is happy with her rejuvenated part-time business and being able to cross something off her bucket list. "It's a business. You are still going to have to do the same basic things to run that business. You will need checking accounts, a business plan, and you will need to invest in yourself and your business. You are the worker bee and the boss." Maria acknowledges that running a business of any kind is hard work. "This is not a get rich quick way of life," says Maria, "but it's a great social outlet and a great way to meet friends." Next up this series: a fourth grade teacher whose online game playing and love of chocolate resulted in her launching a career as a Dove Chocolatier. · YoUr Turn! Have an interesting story to tell? Submit it to AOL Jobs.